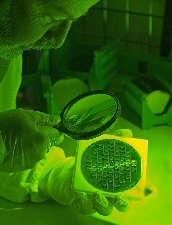 Silicon wafers are an integral part of today’s evolving technologies sector. The semiconductor materials market requires silicon wafers with precise specifications to produce a vast array of new integrated circuit devices. NOVA recognizes that as semiconductor-manufacturing expenses increase, the cost of those manufacturing materials, such as silicon wafers, also rises. We understand the importance of both quality and cost efficiency in the products that we offer to our customers. At NOVA we are able to meet the same exacting specifications that our customers require at a fraction of the cost of our competitors. How? Our business involves the evaluation, classification and sorting of surplus from major silicon manufacturers and fabs around the world. At NOVA, we catalog and categorize excess wafers produced by manufacturers from major orders, as well as wafers that may have been produced with specifications other than those requested by the customer. As a non-manufacturer, we are pleased to provide wafers deltacortene at competitive prices, without the additional manufacturer’s production expenses added to the cost of the finished products. NOVA passes these savings directly to our customers. NOVA is a HUB certified woman owned small business providing the best service in the industry since 1989. Let us be your one-stop shop for all your ingot, wafer and cleanroom needs! We service a variety of needs, ranging from 1" to 300mm diameter, various types of substrates as well as process services. We offer polished wafers of the highest standard of cleanliness and flatness, as well as various films such as thermal oxide, silicon nitride, metals, etc. If you have a specific request, please contact us at sales@novawafers.com or phone (972) 478-7002.